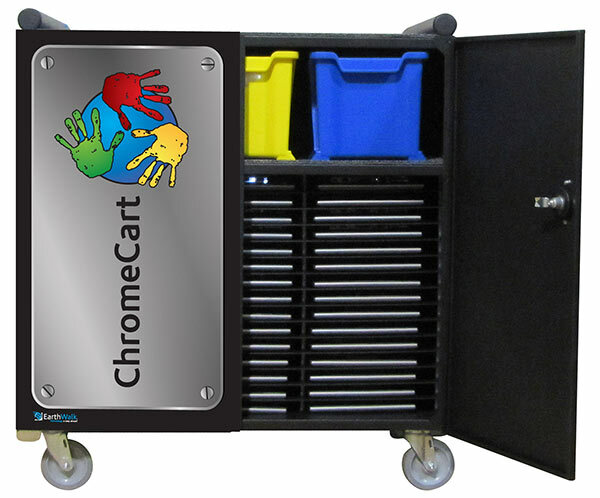 Available in 30, 40 and 45 user options (Models CC30+, CC40 and CC45+), these carts for Chromebooks feature individual horizontal storage areas large enough for devices having up to 14” screens. Carts have welded-steel construction with a small, space-saving footprint and optional custom upgrades to fit your specific needs. 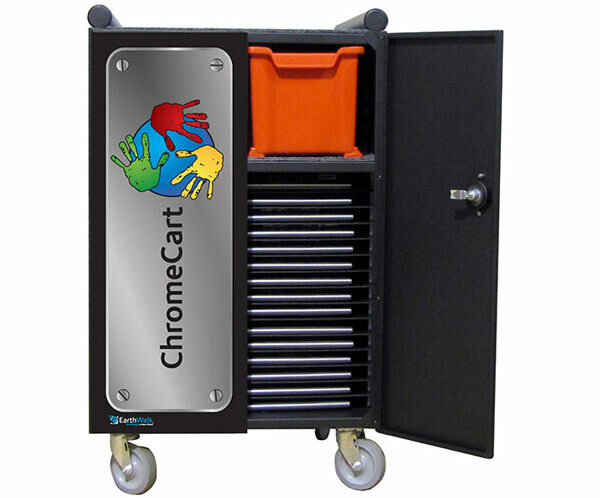 With this series of Chromebook carts you can store, charge and sync multiple devices—all customized to fit your budget. 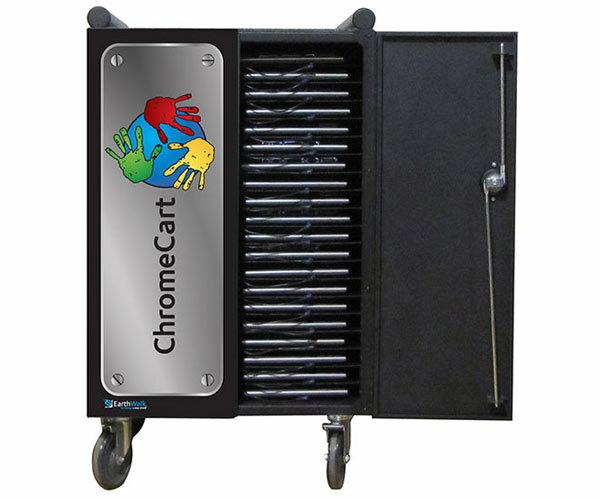 ChromeCarts not only store, secure, charge and deploy Chromebooks—this series is also compatible with most Ultrabook, Netbook and Tablet devices. Weight: Approx. * 81.65 kg / 180 Ibs. Weight: Approx. * 118 kg / 260 Ibs. For budget-minded consumers, EarthWalk carts & labs can be configured with AC power outlets in each storage compartment for use with each device’s AC adapter. NOTE: When using AC adapters to charge devices’ internal batteries, it is possible that all devices may not simultaneously charge. Depending on your device, this solution may require an electric timer to safely switch between groups of devices to prevent overloading the electrical circuit. Deployments using devices’ AC adapters for charging can be configured with EarthWalk’s Digital AC-SMART Switching system. This system can autosense the amount of electrical draw required by each device’s AC adapter and safely switch between groups of devices to prevent overloading the electrical circuit. The digital smart switching system will monitor and continue increasing the number of devices that are being simultaneously charged to help shorten the total lab charging cycle. Select EarthWalk’s iSync package and create the perfect charging and synchronizing solution for your iPads or USB tablet devices. The iSync solution features a high efficiency central power supply system with a 16 port USB Sync/Charge circuit board. Additional iSync systems can be daisy-chained to increase system capacities. Pre-installed 30-pin or Lightning data cables in each storage compartment make iPad deployment and support super convenient. EarthWalk carts can be custom configured to integrate additional wireless access points or router systems. This system can provide complete wireless access or help enhance your existing infrastructure by providing additional access as the wireless clients are moved from location to location. The system provides Ethernet uplink to the cart and any required hardwired to wireless switching component. EarthWalk can supply the wireless components or custom integrate any specific or existing electrical components your network may require. Provide additional secure storage for headphones and peripherals or use to deploy your Chromebooks in different areas or classrooms. Molded from strong, durable, industrial-grade polymers, Super-Size ChromeCart Bins are resistant to acid and alkali spills. Sturdy, one-piece construction is water-, rust- and corrosion-proof.